Microsoft Chairman Bill Gates says computer programming is easy: "Addition, subtraction, that's about it." (CNN) - Hey kids! Forget trying to become a doctor or rapper or a football star, not to mention all the teasing you may get in school for being a nerd - computers are where it's at. That's one message of a new video in which Microsoft Chairman Bill Gates, Facebook co-founder Mark Zuckerberg, Twitter co-founder Jack Dorsey and other tech execs urge young people to learn computer programming. "Learning how to program didn't start off with wanting to learn all of computer science or trying to master this discipline or anything like that," Zuckerberg says. "It started off because I wanted to do this one simple thing - I wanted to make something that was fun for myself and my sisters." 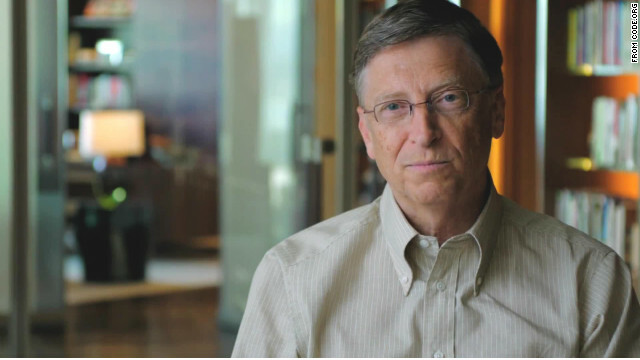 Gates says, "I was 13 when I first got access to a computer. I wrote a program to play tick-tack-toe." The five-minute clip, called "What Most Schools Don't Teach," was posted online Tuesday by Code.org, a new nonprofit foundation that seeks to cultivate computer science in U.S. school curricula. The foundation argues there is a worldwide shortage of computer programmers but that only 1 in 10 schools in America teach kids how to code. "Our policy (at Facebook) is literally to hire as many talented engineers as we can find," Zuckerberg says. "The whole limit in the system is that there aren't enough people who are trained and have these skills today." (CNN) - It probably won't surprise you that millions of underage kids - some as young as age 8 - are on Facebook, despite rules that prohibit children under 13 from joining the social-networking site. What may be more startling, however, is this: Their parents are helping to sign them up. These are among the findings of a new study appearing this week in First Monday, a peer-reviewed online journal. The four co-authors of the study argue that such age restrictions, inspired by the Children's Online Privacy Protection Act, or COPPA, are mostly ignored by kids and parents and only encourage dishonesty.